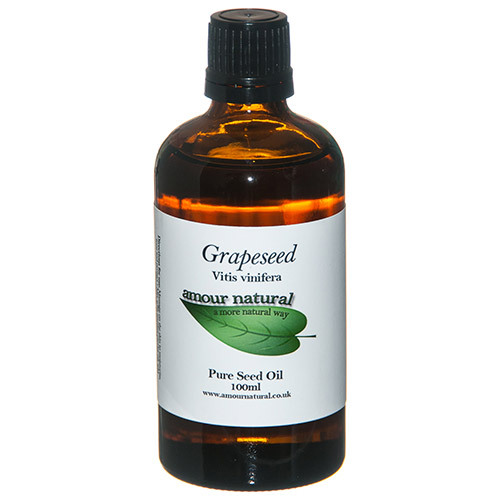 Grapeseed oil is a light and odourless oil that is extremely useful for massage and skincare products. It is useful as a base for a massage oil, mixing with essential oils and other carrier oils. It may also be useful for tightening and toning skin, hydrating the skin without being greasy and protecting cell membranes from oxidative damage. Grapeseed oil is cold-pressed and extracted from the seeds of grapes, a fruit that is native to Asia and also found in Europe and North America. Grape seeds have high levels of vitamin E, flavonoids (including procyanidin) and antioxidants (including OPC’s - oligomeric proanthocyanidin complexes) and linoleic acid. This nourishing complex of active ingredients helps to regenerate the skin and protect cell membranes from damage. The fatty acid content accounts for the oils moisturising and nourishing affects. It is also mildly astringent and easily absorbed which prevents the oil from being too greasy on the skin. It is suitable for all skin types but is especially valuable for people with delicate, sensitive or greasy skin. Below are reviews of Amour Natural Grapeseed Pure Seed Oil - 100ml by bodykind customers. If you have tried this product we'd love to hear what you think so please leave a review. Happy with my purchase - it is what it says it is.